Thank you Dr. Ravaei for treating my feet, everything looks and feels great. 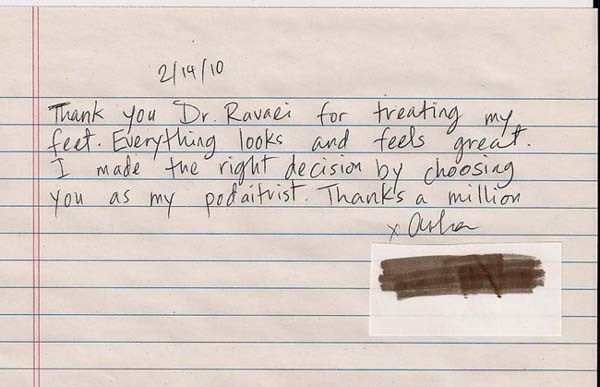 I made the right decision by choosing you as my podiatrist, Thanks a million. My name is Diamond, and I am very happy with my results from Dr. Ravaei. My Bunion no longer bothers me. He is an excellent Doctor and I would recommend him to anyone. 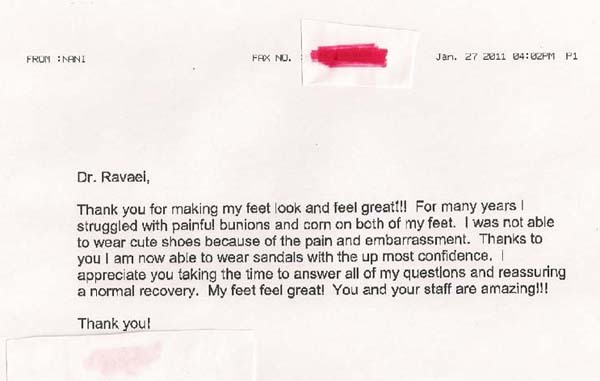 Dr. Ravaei, Thank you so much for all your help and care with my feet! When I first began having foot pain, I didn't think running would be an option for me anymore. Thanks to you I have been running every day! Dr. Ravaei did a remarkable operation on my left foot, big toe. I was unable to walk or the touch the area. After the operation, I again am able to walk, jog and exercise with no pain or discomfort. I strongly recommend Dr. Ravaei since he is top notch not only as a Foot & ankle specialist, but also a doctor with professional mannerism. I am so happy that I had the surgery done on my feet, now I can wear all of the shoes that I couldn't wear before. I love my feet now and I don't feel that I have to hide them any longer. Great job Dr. Sean Ravaei!!!!!!! I had been dealing with painful bunions for years but had never considered surgery until I met with Dr. Ravaei. During my initial consultation I was impressed with the amount of time Dr. Ravaei spent answering my questions to make sure I was comfortable with the process. Now that my feet have healed, they look and feel great! I would highly recommend Dr. Ravaei and his friendly, courteous staff to anyone! Thank you for making my feet look and feel great!!! For many years I struggled with painful bunions and corn on both of my feet. I was unable to wear cute shoes because of the pain and embarrassment. Thanks to you, I am now able to wear sandals with the up most confidence. I appreciate you taking the time to answer all of my questions and reassuring a normal recovery. My feet feel great! You and your staff are amazing!!! My experience with Dr. Ravaei has been nothing short of exceptional. I had prior foot surgery that I was not quite satisfied with and decided to get some additional work done. Researching various doctors, I found Dr. Ravaei. 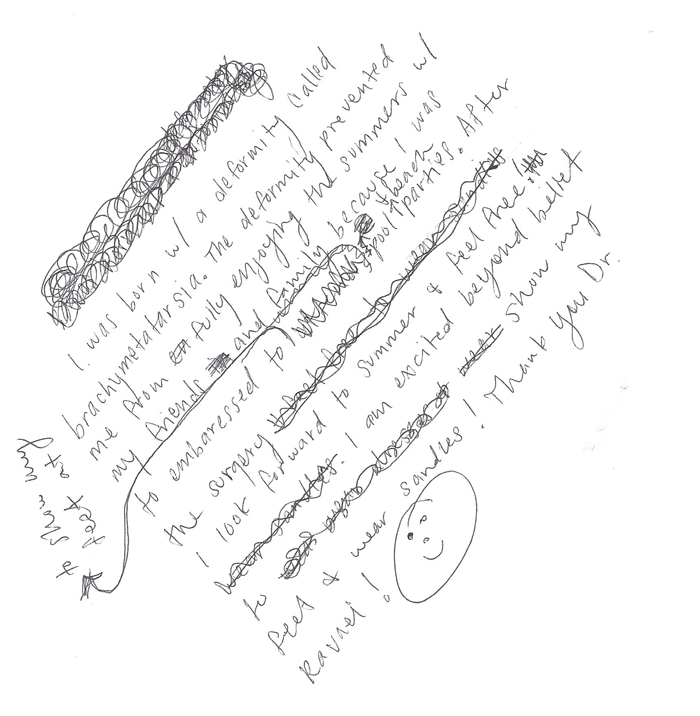 Upon completion of our consult, Dr. Ravaei immediately put me at ease with his professionalism and calming demeanor. He explained the surgery in detail and answered any questions I had which also alleviated any reservation I had. After the surgery, frequent follow ups and accessibility to questions complemented the entire experience. 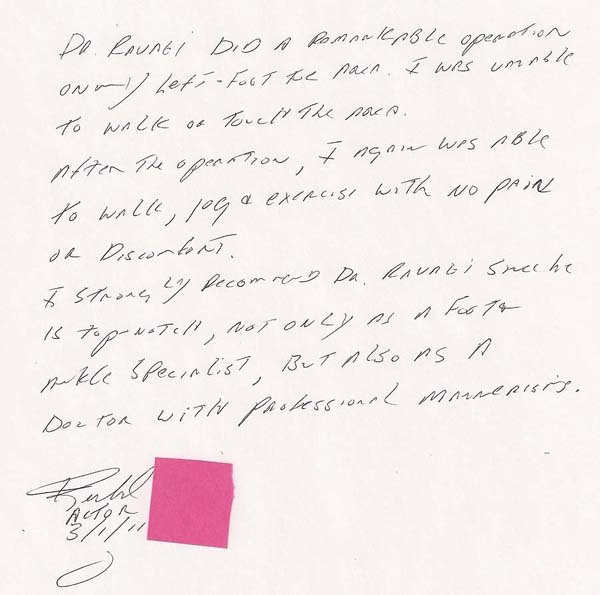 Dr. Ravaei knows his feet and would not recommend any other to do the job. Dr. Ravaei and his staff have been very courteous and professional. I am very pleased with the outcome of my surgery and would highly recommend his services to others. Dr. Ravaei you are the man with miracle hands. My feet feel and look great thanks to you. You are the BEST! 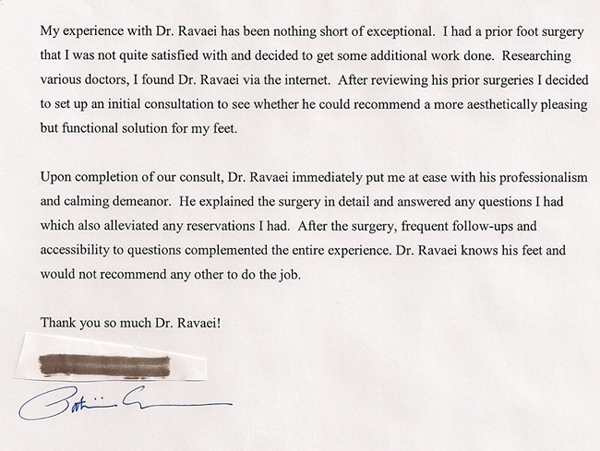 My experience with Dr. Ravaei was extremely positive. Both he and his staff made me so comfortable though-out the process of my foot surgery. I would most definitely recommend Dr. Ravaei to my family or friends. I was born w/a deformity called brachymetatarsia. The deformity prevented me from fully enjoying the summers w/my friends and family because I was too embarrassed to show my feet at the pool, the beach and parties. After the surgery I look forward to summer to feel free. I am excited beyond belief to show my feet and wear sandles! Thank you Dr. Ravaei!